The richness of variations in Indonesian ethnic groups implies to the great deal of variations of the concepts of aesthetics. Each ethnicity emerges the customs and we can observe the emerging collective “taste” of each ethnic group by diving into the information extraction of the traditional heritages. It includes the taste of melody and things that can be categorized as beautiful sounds. The theme of the songs cover a wide range of theme, from spirituality to cradle songs, from romantic love to patriotism, while some of them are attached so deeply with their customs and traditions. Mathamatical and computational analysis has made it is possible to extract information within songs or melodic expressions - statistical physics has contributed a lot to this issue. Thus, there have been a lot of conjectures to capture the enjoyment that is signified by music. This works bring us to some hypotheses of the smallest unit of information signifying songs one another. This opens a door for other further analysis: the evolutionary models: memetics. The elementary informations used here is related to the distribution of pitches and the respective durations, the variables used as we model the melodic sequences into spiralling movement, and some other statistical parameters. Most of the data used in this research is collected with participation of people by employing the Open Digital Library of Indonesian Cultural Heritage initiated in the Indonesian Archipelago Cultural Initiatives (IACI). First, observations through hundreds of traditional songs in Indonesian archipelago (as well as thousands of populars songs) have brought to some interesting conjectures. One of them is the phylomemetic tree of Indonesian traditional songs; a map that can be regarded as the tree representing the innovations of songs. 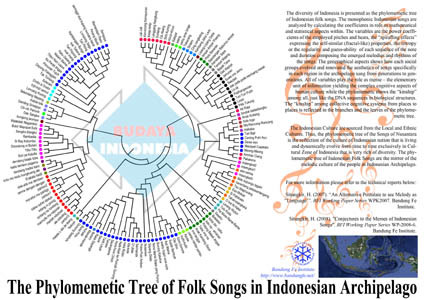 From the Phylomemetic Tree of Indonesian Traditional Songs, we have a demonstration showing the relations - or "kinship" - of amongs songs from all over the ethnic cultures in the archipelago. You might want to hear the similarities of the traditional songs as mapped in the phylomemetic tree by downloading the app from Android Google Play or your Apple iPad, iPhone, and iPod Touch appStore. The Second, as we have calucalated the songs elementary variables representing all of the songs, we could computationally built algorithms for generating songs that would fit the particular songs. This is the nature of the complexity research conducted in Bandung Fe Institute. By generating melodic expressions we can observe through the landscapes in which the aesthetics of songs built by our traditional, as well as popular and industrial culture nowadays. The latest has brought us the possibility of contribution to the Generative Art in Music. This is an interesting task of research for it could enhance the process musical creations, as you might would like to browse in the gallery of this website. Overall, the research as demonstrated and brought to you by this website has reflected how the vast diversity in Indonesian traditional cultures might enhance and inspire the creative products that potentially bring colors to modern civilisations. The research on this musical projects are still on going. Make sure you visit this website regularly for updates, or simply subscribe to BFI Newsletter. Copyright 2010 Bandung Fe Institute. All Rights Reserved.